it has rarely happened. almost never have i been sent an item of clothing apparel for review that simply didn't fit. generally speaking, i'm a medium in jackets, jerseys and the like, but small in shorts, bibtights etc. cycling itself is a great leveller, so while the years have passed, the metabolism has slowed and mrs washingmachinepost has subtly increased my portion sizes (at least, that's the way it seems), i have no difficulty in continuing to fit both sizes. in fact, on the odd occasion when i've been inadvertantly sent a size small in a jersey, even those have fitted (if just a smidgeon shorter than desirable). there is also the distinct advantage, when you're a famous cycling journalist, of being able to phone the appropriate person to ask if a swap might be effected when an error has been made. though there are few, if any cycle clothing providers who will not offer to swap in the event of the customer having ordered the wrong size, when you've spent anything up to a week awaiting delivery of the latest in cycle fashion, it can be soul destroying to discover it doesn't fit, followed by the faff involved in arranging an exchange. that means probably joining the sunday ride wearing last week's jersey. the trouble is, there seems to be little in the way of size comparison between some of the world's major apparel providers. the fact that you can comfortably wear a medium in rapha, does not necessarily mean that you can opt for the same from endura or castelli. granted, if we resort to a finely crafted venn diagram, there's likely to be something of an overlap, but when many of us have little option but to shop online, it would be kind of nice to discover an all but foolproof system for ironing out the irregularities prior to clicking the paypal button. actually, that day might be a tad closer than you may think. freda casey, in a worthwhile fit of perspicacious thought has originated the idea of providing a web page into which chest, waist and hips size can be input. these figures are then matched against a database that ultimately shows which brands and size would be the best fit. 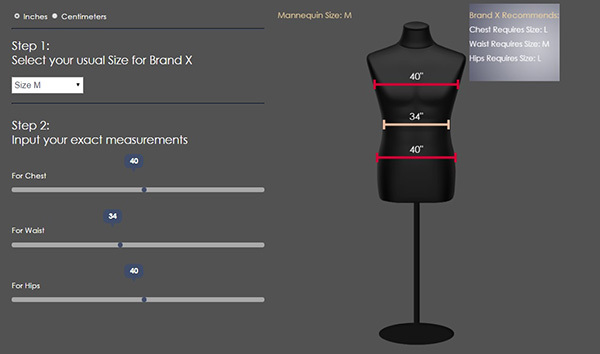 the sliders shown on the web page allow user input to check how much the numbers (or your figure) would need to be manipulated to effect a decent fit. there's every possibility such a feature could help remove the iniquities involved in buying cycle clothing online. freda does not, however, profess to have ironed out all the problems. in order to better suit potential users of the site, i have appended two survey links below asking if you figure it's a good idea or otherwise, also providing space for relevant comments. said freda, "This is just a demo at the moment, showing Brand X as an example. But i hope to develop it to cover all the major brands with the exact sizing detail of each brand i.e. Castelli, Santini, Core, Sportful etc. So the user will be able to see, by the brand that they want, what size, and shape they are for that jersey before they purchase it." it's a means of bringing that 'trying it on' experience closer to the experience of buying online.